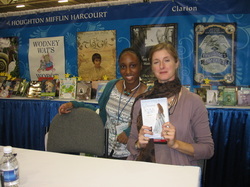 Check out all the authors that we met during ALA Annual in New Orleans in June 2011! Members of Bookmarked were invited to the American Library Association (ALA) annual conference that was held in June in New Orleans. The purpose of the invitation was for the students to speak to a committee that selects the list for Best Fiction for Young Adults sponsored by YALSA, a division of ALA. Luckily, for the students they were given time to roam the exhibit hall before hand. They got to meet the many authors on the floor, and I did not miss the opportunity for the photo ops. The picture on the left has the seven teens surrounding author, Lauren Myracle in the center. The librarian is standing in the back, second from the right. Orson Scott Card is one of Taylor students' favorite sci fi author. He wrote the Ender's Game series. 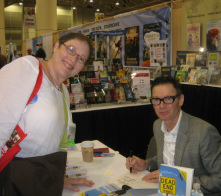 Author, Jack Gantos, poses with the librarian. He wrote the Joey Pigza books. 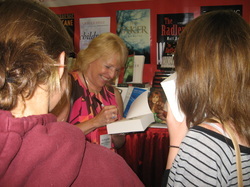 Ellen Hopkins was not scheduled to sign, but she graciously met the teens and signed a book for each of them. Catherine Gilbert Murdock's new book wasn't available for her to sign, and all of her books are already in the library. She was kind enought to stop and chat with us. Katie Crouch talked to a group of seniors and members of Bookmarked about what it takes to be a good writer. She explained that three things are all it took to become good at the craft of writing. You need to write daily, read good books (great authors give great inspiration), and stay off the Internet. She meant that too much time on the Internet meant that you would be distracted and not be able to focus on writing. At one point, Katie was living in Iowa and rented an old schoolhouse so that she could write in the quiet without access to the outside world. The students had a lot of questions for her. There was a heated discussion of favorite young adult authors, as well as Twilight the book or the movie or at all. We may have thought that the Twilight phenomenon was over, but yesterday it spurred a lot of discussion. We again want to thank Judith Lafitte at Octavia Books for bringing her to Patrick Taylor, as well as her publisher, Little Brown. Katie shares her diary from 4th grade. She has been writing daily since she was young. 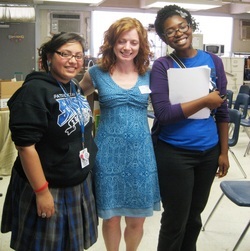 Two members of Bookmarked pose with the author after the presentation. The students were active listeners as Katie made her presentation. J & P Voekel returned to Taylor to tell the 6th and 7th graders about their recent adventures in Mexico. On Tuesday, March 22, 2011, the students were treated to a return trip through the rain forest with the Voelkels. Jon and Pamela Voelkel visited Taylor in April of 2010. They were so impressed with the Taylor students and library that they mentioned us in the acknowledgements in book 2 of the Jaguar Stones series. Click the image below to read their kind words. The presentation was a multi-media extravaganza. They showed video of their family trip to visit the Maya in Mexico. Jon eating termites, scorpion, and monkey was a real highlight. Students had a chance to participate in a rock band rock out. The authors also gave the students some lessons in Mayan culture which prompted one of our 6th graders to tell the audience that he was of Mayan ancestry. So Pamela strapped the microphone and the adventurer's hat on him so he could tell us about his family's trip to Copan in Honduras. There is a Mayan ruin there that the Voelkels are dying to visit. Thanks Egmont and Judith and Tom at Octavia Books for bringing the Voelkels to visit. Brianna Frickey, a 7th grader who met the Voelkels in 2010, said, "Their presentation keeps getting better and better." Sixth grader, Kristin Plaisance, says, " It was amazing. I loved it! I really liked how all the technology worked so smoothly." A sampling from other 6th graders included: "It was cool;" "I liked the music;" "I liked hearing about their research in Mexico that connected with the books;" "They turned stories into real life." Another student said, "I can't wait to see what they do next year." We will cross our fingers that they will be traveling this way next spring when Book 3 is released. Author, Laurie Halse Anderson, gave the students a lesson on the American Revolution. On Thursday, November 18, 2010 Laurie Halse Anderson visited Taylor to make a presentation to all the 7th, 8th, and 9th grade classes. Our school was her last school visit of a five week tour. We are glad that she saved the best for last. She was on tour to promote Forge, the second in the Seeds of America series. Forge focuses on Curzon, the slave boy that Isabel helps in the first book, Chains. Forge in the title is for the winter that the troops spent at Valley Forge. The students were fascinated with her take on history, and one commented that she never liked history until she heard it told in stories by Ms. Anderson. This visit would not have been possible without the support of publisher Simon and Schuster and Octavia Books. Author, Scott Westerfeld, explains in pictures where he got inspiration for his new book, Behemoth. On Monday, October 18, 2010 Taylor kicked off Teen Read Week for 2010 with a visit by Scott Westerfeld. All the 9th and 10th graders attended his outstanding presentation. He explained to us why he included pictures in the Leviathan series. Novels published in the early 20th century were always illustrated. Since the book is set in 1914, it seemed filling to include pictures. He also gave us some insight into how he collaborated with the book's illustrator. After the presentation, Scott joined Bookmarked in the library for a New Orleans lunch of shrimp poor boys and Zapp's chips. It was a great way to begin Teen Read Week. 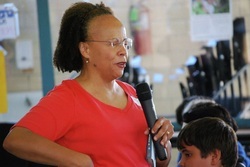 Again, we want to thank Octavia Books along with Simon and Schuster for helping to bring this event to Patrick Taylor. Scott shares the map of 1914 Europe in his alternate history. Scott's peppered his talk with several good jokes. Scott and his wife, Justine Larbalestier signed for us. 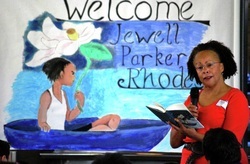 The 6th and 7th graders were in for a real treat on Monday, September 27, 2010 when Jewell Parker Rhodes came to Taylor. She gave the students an animated reading of several sections of the book, and also explained the inspiration for some of the characters. Even though she has never lived in New Orleans, she feels a real connection. Several of her adult books are set in New Orleans just like Ninth Ward is. We want to thank Octavia Books and the publisher Little Brown for providing the students this wonderful opportunity.